I Was 14 When Stage Fright During a New York Audition Foiled My Plans For the Future. A Thriving Arts Scene In California’s Central Valley Came To My Rescue. As a child, I was always singing. I’d walk up and down my street in New Rochelle, New York, singing the crooner songs I heard at home: Tom Jones, Engelbert Humperdinck, Nat King Cole, Tony Bennett, and Sammy Davis, Jr. In 1967, when I was 8 years old, my sister, Sherille, took me to see the musical I Do! I Do! on Broadway. From that moment on, I started to emulate the big, powerful voices of the Broadway stage. My mother enrolled me in the Stella Adler Acting Studio and voice lessons at Lincoln Center in Manhattan, and got me a manager. I’d take the A bus from New Rochelle into the Bronx and then ride the subway to auditions all over the city. When I was 11, I was cast in a Broadway musical, The Me Nobody Knows. I also performed for about nine months in Chicago, took part in three summer stock musicals, did some recordings with other child singers, and got parts in a few films. Then, at the age of 14, I went to an audition of Seesaw and froze, unable to sing. I’ll never forget the look on my mother’s face. She looked so disappointed and angry. I’d gotten stage fright. The fear lasted for decades. I stopped performing on stage. I did a stint in the U.S. Air Force and took various jobs in and around New York and Connecticut. In 1991, when I was in my 30s, I moved to California and took a job working at a psychiatric ward in Modesto. I kept telling myself I’d go back to singing and acting one day. Then, in 1994, I saw a notice in The Modesto Bee for auditions for The King and I, put on by the Modesto Performing Arts. I decided to try out. The next thing I knew, I was cast as the lead. I got roles with other companies and other productions, including Frankenstein, The Marriage of Figaro, and Jesus Christ Superstar. I also worked outside of Modesto, in nearby cities like Sonora, Newman, and Merced. Sometimes I went directly from a performance to work the night shift. In the 20 years I’ve lived in Modesto, the theater scene in the region has grown, and there is more opportunity than ever to be an actor or singer. Young people who are interested in performing in theater arts and dance have more choices now, too. I see more parents who are supporting their children getting into the arts and encouraging them to excel. The Yes Company in Modesto is a place where you see kids of all races getting excited about musical theater. When the Gallo Center for the Arts opened downtown in 2007, it brought in a plethora of bigger names and acts, and people initially worried it would cause the little companies to go by the wayside. Fortunately, those fears were unfounded. Instead, the Gallo Center actively promoted and partnered with small theater groups in the area, and gave them the opportunity to use its space for productions. New types of theater have developed in and around Modesto and helped to attract a more diverse audience. Now you see farmers, liberals, conservatives, gays and lesbians, Latinos, African Americans, and Asian Americans in the audience—and on the stage. One example is the Sankofa Theater Company, formed in 2012 by four African-American actors. The group is named after an African proverb about returning to your past to learn where you are headed. In the past, you rarely saw a black person going to the theater here in Modesto. But stage productions by Sankofa draw people of all races, including many African Americans. Sankofa recruited me earlier this year for the role of Doaker in August Wilson’s The Piano Lesson. This summer, we worked together again on a production of Looking Over the President’s Shoulder, a one-man play by James Still, at the Gallo Center for the Arts. 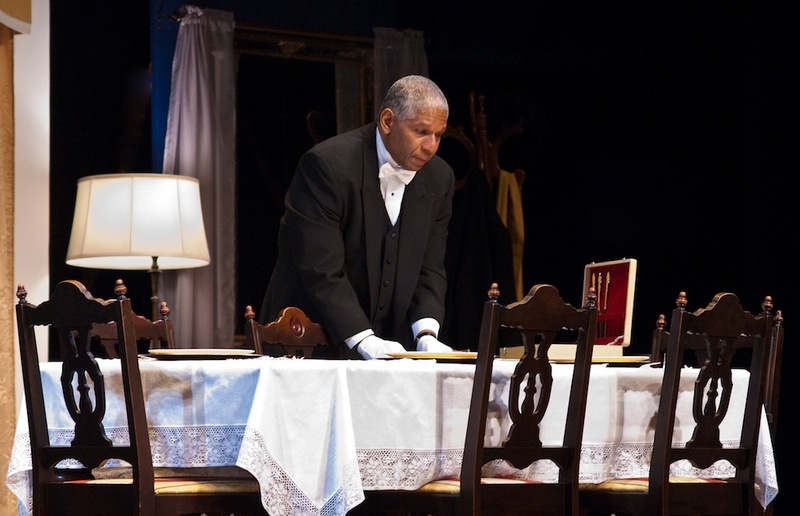 The play is based on the memoirs of Alonzo Fields, who was chief butler in the White House during the administrations of Hoover, Roosevelt, Truman, and Eisenhower. He was the grandson of a freed slave and dreamed of becoming a classically trained opera singer, but to make ends meet he took a job in the White House for one winter. He ended up staying for 21 years. I first saw the play about 12 years ago in San Francisco. I thought it was brilliant in its portrayal of the deferred dreams and quiet dignity of its protagonist. I walked out of the theater and said to myself, “I’m going to do this show.” In late 2008, I secured the script and pitched the idea to a local director and producer. It ran for three weeks to high critical acclaim at Townsend Opera Players’ Little Opera Hall in Modesto and was reprised in 2011 at the West Side Theatre in Newman, California, about 30 miles south of Modesto. Then Sankofa put on the show this summer at Gallo Center for the Arts. It was phenomenal. I’ve never gotten that many bravos. Why did so many denizens of Modesto leave their homes and television sets to come out for a one-man play? Why, with so many choices in this day and age, do we still bother with live theater? In my view, nothing can match the intimacy. It is exhilarating and electrifying for both performer and audience to share that closeness. Today, I’m semi-retired and pursuing my craft as intensely as ever. Someday, I hope to return to the Broadway stage to perform. As I prepare for that, the abundant support for the arts in Modesto has allowed me to keep seeking out new challenges. Dwight D. Mahabir is an actor/baritone who resides in the Central Valley. He will be performing in upcoming productions of Cinderella, Medea, and Much Ado About Nothing for the African American Shakespeare Company in San Francisco. You can check out his website at http://www.dwightdeanmahabir.info/. Primary Editor: Becca MacLaren. Secondary Editor: T.A. Frank. *Photo courtesy of Dwight D. Mahabir.